Remember the days of recording a call, then downloading it, then uploading it, then saving it... somewhere? Now its easy to share Jiminny recordings not only with your team - but to any email address. Send recordings outside of Jiminny in a flash with our new Export Portal. Find the recording in Playback and select Export to send a secure link of the call or meeting recording. 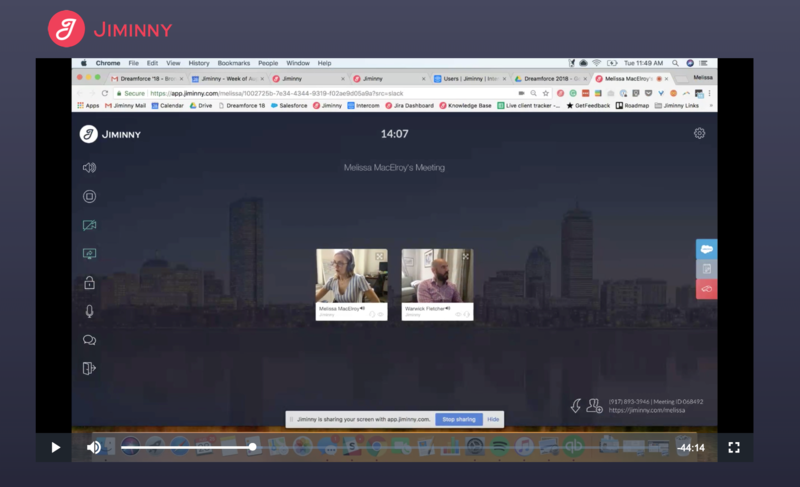 If the Jiminny meeting was synced to a calendar event, we'll instantly populate the emails of all members who joined the meeting from an external domain (outside of your organization). You can type or copy+paste in as many emails as you'd like (just press enter in between). Add a note to provide context or to give a recap of the call. Anyone you send an export to will receive an email in their inbox, with your note and a secure link to the recording. Note: If any email addresses are invalid, the export request will not be sent. There will be a "Listen Back" button in the email. Clicking that email will bring them to a portal which displays both the audio and screen share video recorded during the meeting. When you send an export, you'll get an email notification when the person clicks on the link to Listen Back. Now the powerful insights captured during your recorded sales conversations can be shared with anyone.